Your feet are unique. When you order custom shoes, I will dedicate lasts for your shoes only. They will be modified to suit your preferences, shaped to fit your feet. Patterns are made specifically to fit a last, so this means custom patterns are made to fit your lasts. You can choose heel height, toe shape, materials, construction type and style. It’s a lot to consider but I will guide you through the process. The object is the shoe, but the subject is you. 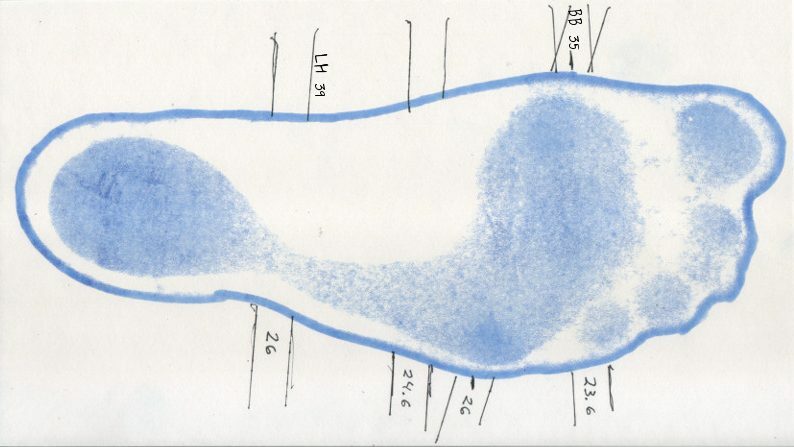 Learning about your feet and what is comfortable for you is the essential part of making a shoe you will love to wear. Prices start at $1,850. Requests for specialized or exotic materials may increase the price of producing your shoes. In the gallery you will find pictures and a brief description of some of the custom shoes I’ve made. Please contact me to have custom shoes made for you. Read on to find out what is included when you order custom shoes. 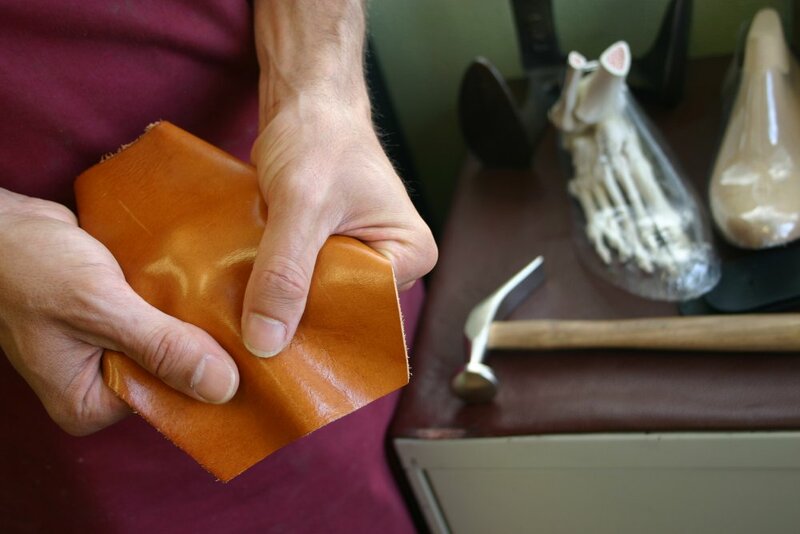 How much leather does it take to make a pair of leather shoes? A lot. 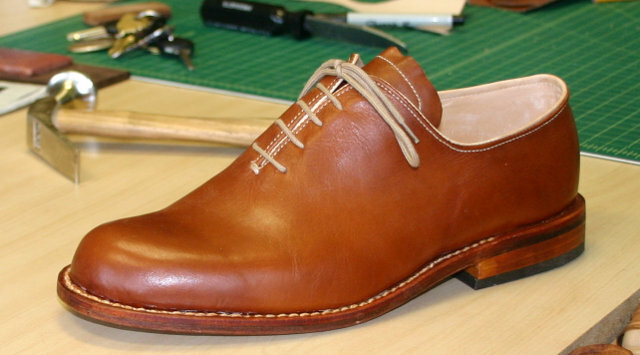 Leather shoes mean leather uppers and leather components. Below is are pictures of the pieces laid out for you to see. 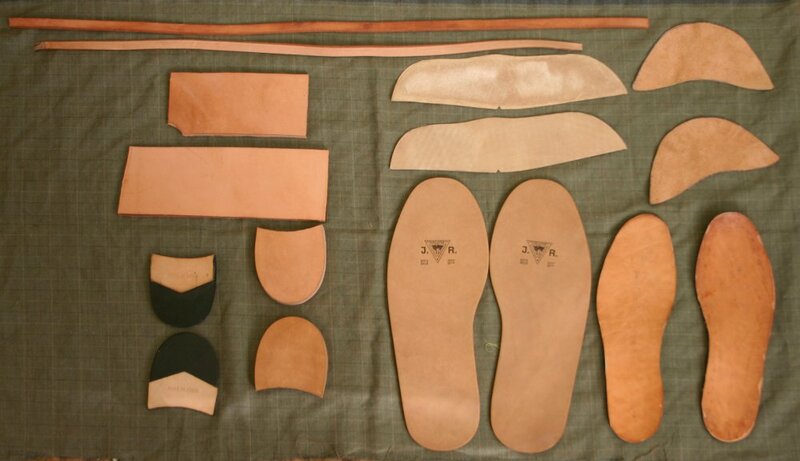 The components include: insoles, counters for heel and toe, heel lifts, welt, outsoles and sometimes also a midsole (not pictured) which is the same size as the outsole. The upper pictured includes: vamps, quarters, tongues, backstraps, collars, vamp liners and quarter liners. The two pictures combined are 7 feet wide by 2 feet high. All this gets assembled into a neat little package that looks deceptively minimalist. The custom process starts with a print of your foot. This is a weight-bearing impression on an ink mat. An outline of each foot is drawn as well. About 6 landmarks are measured with a flexible tape. The prints with measurements will tell me the length and width of your feet, as well as their circumference and how your feet carry your weight. I will select a last that I believe will be a good starting point for customization. We will work together to fine tune the fit, but first a new last is ordered for you. While many aspects of the fit can be customized, some dimensions of the last are fixed and can only be changed by ordering a different last to begin with. 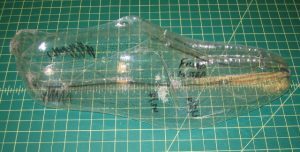 Heel height is one of those dimensions that can’t be changed significantly. 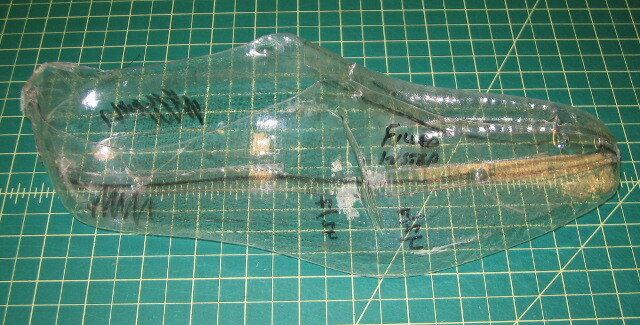 For example, a shoe built on a last with a 1″ heel can not become a 2″ heel by simply adding a higher heel. The higher heel will throw off the balance for the rest of the last. I usually make a vacuum form of the last to help validate our starting point. With your foot inside this clear mold, I will be able to see if your feet press the borders of the lasts and if so, how much. We mark this up together with a sharpie and modifications are made accordingly. All modifications are incorporated directly onto the lasts. The wooden lasts are sanded down or built up or sometimes a combination of both. Once the fit is as you like, more shoes can be made with exactly the same fit each time. Different colors and styles as well as low shoes or even ankle boots can all be made from the same last. I keep these lasts exclusively for you. 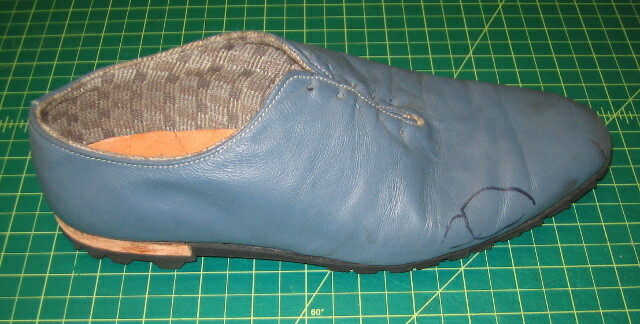 Fit modifications and the pattern are tested with trial shoes. Trial shoes are made of less expensive material than the final shoes and are primarily to give you the opportunity to preview the fit. You will wear them for two weeks or so and also mark them up as needed to indicate where they are too tight, too loose or whatever. It takes some time to get a feel for them and only you can judge how they feel. There is no hurry to finish this phase. Depending on what modifications are required as a result of the trial shoes, as second pair of trial shoes may be made. We work hard together to get the fit right. You can find more pictures of completed shoes under Gallery. 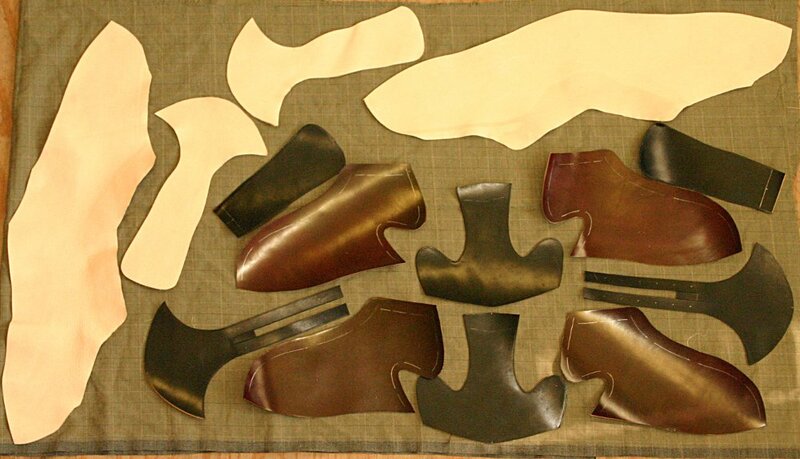 More information about the materials and the process of making shoes by hand can be found on the Shoemaking page.